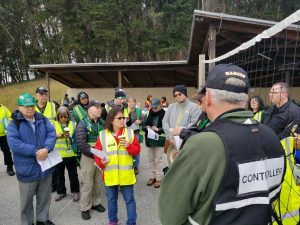 CONSTANT Associates recently served as the Lead Designer for San Mateo County Health in the execution of their 2018 Green Dawn Full Scale Exercise (Spring), and their 2018 CHEMPACK Tabletop and Full Scale Exercises (Fall). This project included the design, conduct, and evaluation of a Spring Full Scale Exercise centered on City CERT team deployments to assist public health and medical response to a large-scale emergency. CERT teams were deployed to two local parks to assist in triage and light search and rescue in a plane crash scenario. County Health engaged partners across the County to participate, including the American Red Cross, the Office of Emergency Services, the Healthcare Coalition, and many others. This contract also included the design, conduct, and evaluation of a Tabletop Exercise and a Full Scale Exercise as part of the annual Statewide Medical and Health Exercise program, focused around a local CHEMPACK deployment. As part of the full scale exercise County Fire, HAZMAT, Law Enforcement, the National Guard, the FBI, the California Department of Public Health, the CDC, the San Francisco International Airport, the American Red Cross, the local healthcare coalition, and many others coordinated to respond to an intentional chemical release at a local event. CONSTANT coordinated exercise play at multiple sites, including SFO Airport, County Health’s DOC, and the San Mateo County Event Center. The exercise tested request/deployment of the CHEMPACK, full activation of the Health DOC, medical surge support across the healthcare system, and multi-agency coordination at all sites, among other capabilities.